So, after the very good two months of sales Ciaz is fallen below 4K units selling only 3,892 vehicles during October 2018. This is low even compared to last year same month when it sold 4,107 units. Maruti Suzuki sold just 3892 units in October 2018 compared to 4107 units during the same period last year. The sales of the Ciaz degrew by 5.2 per cent. 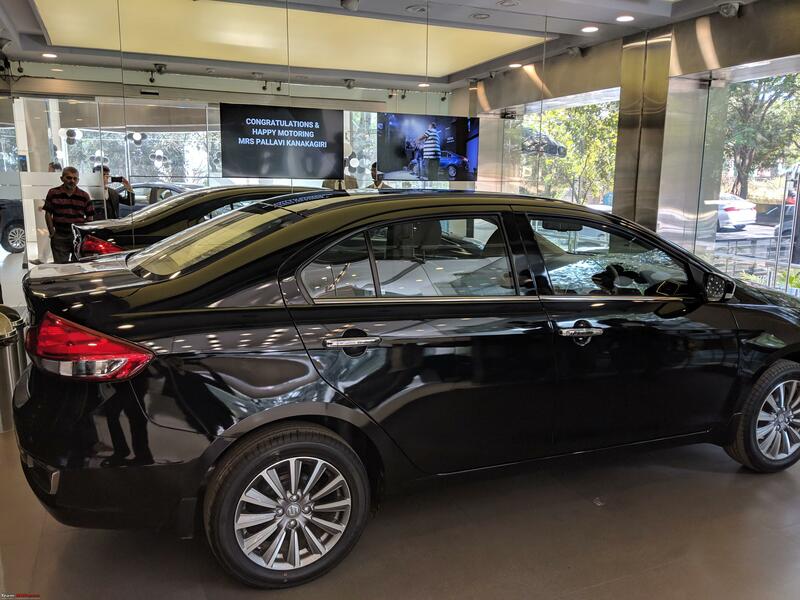 Maruti Suzuki Ciaz Diesel May Need A New Speedometer - Maruti Suzuki issues a service campaign. The ‘Service Campaign’ affects the diesel Zeta and Alpha variants only. 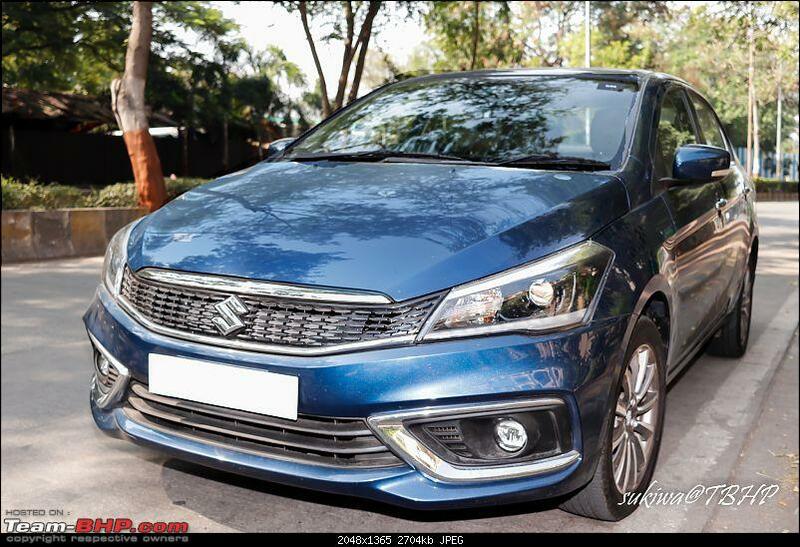 Maruti Suzuki has issued a ‘Service Campaign’ for the new Ciaz. The carmaker is quick to point that it’s not a safety-related recall. Last edited by volkman10 : 2nd November 2018 at 21:15. 880 Ciaz (diesel) to be under the Service Campaign. Last edited by volkman10 : 3rd November 2018 at 09:45. Blame it on the market sentiments the auto industry seems to have a muted sales this festive season. But Ciaz is still the segment leader in October sales, yet again. Why are they calling a recall not a recall? MSIL worried about the word recall bringing down the share prices maybe. All such initiatives by manufacturers are a good thing, voluntary recall and replacement improves customer confidence. NEXA service however is a pain at the moment at least for the Ciaz my friend has, finally took it to twitter to get their attention. Considering that manufacturers delete/ modify features slyly, please add the below brochures to the Official Review. These will be useful in future for any comparison. Does anyone have pics of the 15 inch alloys that come on the zeta variant? Also, if they are same as the 15 inchers on the earlier model (if yes, then no pics needed). Further, has anyone purchasing a zeta variant upgraded to the 16 inchers? If yes, how much did the upgrade cost? Lastly, anybody aware of any discounts that might be available in the month of December (considering December VIN and all)? Suzuki has two huge weak spots against competition. The lackluster engine and the antique automatic gearbox. 2. Provide a larger, noticeable boost from electric power. may need a larger Lithium battery as well. It could also add stronger regenerative braking. Improve efficiency and power experience at the same time. Then plonk the combo into multiple 'sports' or a well named performance models from Swift, Scross, to Ciaz, to Ertiga, Brezza. Give a really hard time to Hyundai, Honda and others. Suzuki's cost of doing this will be lower than competition, and their volumes are far higher especially if they deploy it across models and segments. They can underprice and hurt everything from i20, Creta, Verna, City, ecosport etc. The higher performance space has proven to be cost prohibitive in the past because Suzuki has tried to do it only in small nitches with expensive solutions like imported engines. We all remember the abandoned 1.6L Scross. On the side lines of breakfast meet in Pune. 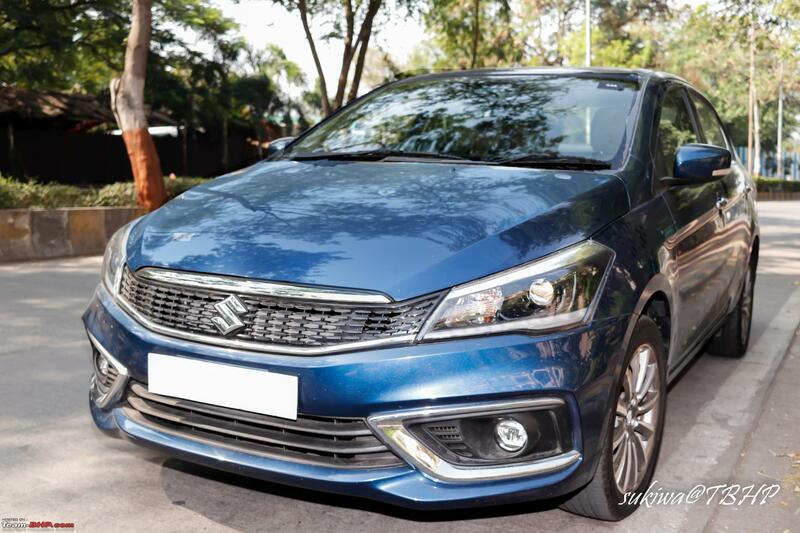 We got to experience the 2018 Maruti Ciaz Facelift (1.5L Petrol) manual car. We popped the hood to see the spacious engine bay, inspected the ECU and fuse box. We checked the secondary Lithium ion battery below the passenger seat. This mild hybrid car is a good thing. I would like to see more such cars before we see all electrics. At least owners can experience it step by step! How was your experience driving the car? can you please share the details on the drive, engine etc. I had not driven this particular car but had test driven the AT Ciaz. It was quick to get moving with 5 adults in the car. As mentioned in the official review here if you accelerate, take off is a bit jerky. You can get some wheelspin too. But that's not a graceful way to take off! The Auto start-stop system is effortless. I drove it for a pretty short distance of may be 2 kms and it was effortless. I don't drive a sedan but was still comfortable with it. Didn't get a chance to test cruise control. Overall was a pleasant experience. I'm no expert to comment on the auto gear shifts and rpms. This is sedate to drive. I've driven the new Dzire, the K12 engine feels peppy for sure. As a package, Ciaz is great value, both for MT and AT petrol sedans. I'll wait for @sukiwa and @blackwasp to share their driving experience. I am getting confused here. You test drove an AT ciaz and you are saying there can be wheel spin on take off. Is it possible to have wheel spin in an AT? Note : I have not driven any TC transmission cars, but have driven AMT WagonR once. Is it possible to have wheel spin in an AT? It is. 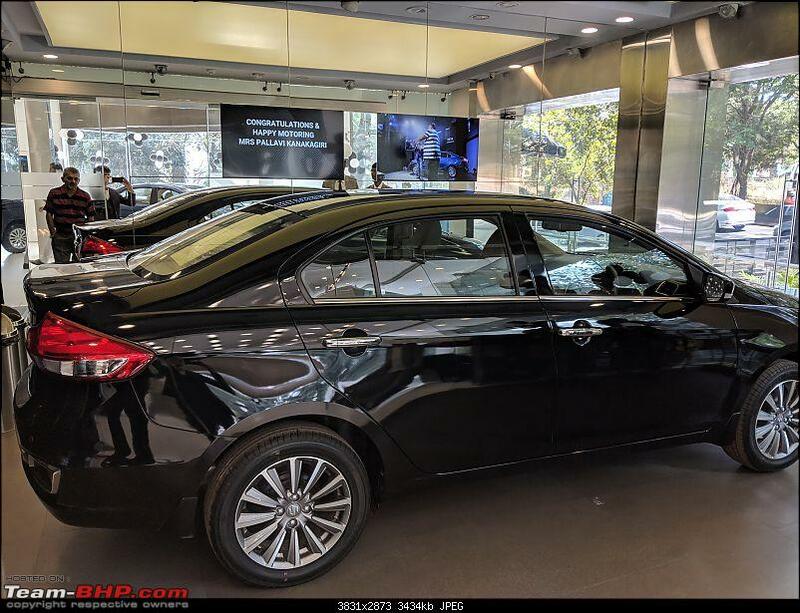 The Ciaz is a light car and the TC transmission multiplies the torque when moving from a standstill and hence it is possible to experience wheelspin while you are just casually moving the car. Happens a lot in our 1.4 AT. Thanks for the clarification. I thought as the clutch application is software controlled this would have been taken care as the basic quality of TC is that ‘it allows slippage’. Got my hands on a black one. Looks best in black IMHO. Will post more pics shortly.